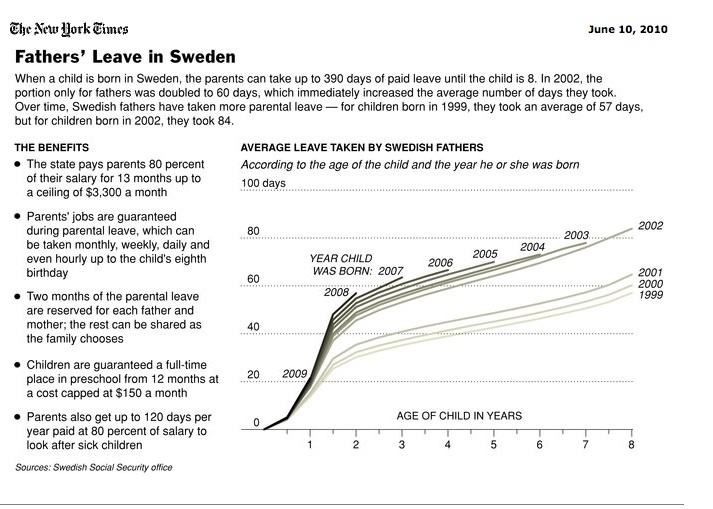 The New York Times reports on Sweden's paternity leave policies. women’s rights, Sweden may be a glimpse of the future. As more men take advantage of paternity leave, less men are defining themselves by their careers and businesses are less likely to penalize men who take time off. Did you check out those benefits in this side graphic? The state pays parents 80 percent of their salary for 13 months up to a ceiling of $3,300 a month. You know what we get here? Six weeks at 50 percent pay and another six week of unpaid time off. That's just for moms. The Swedes do pay a lot of taxes. According to the New York Times, "Taxes account for 47 percent of gross domestic product, compared with 27 percent in the United States and 40 percent in the European Union overall." However, they have a relatively low deficit and a high productivity levels. Charges that these family-friendly policies were going to destroy their economy seem greatly exaggerated. Families like these policy, so much that companies are offering more generous family-friendly policies in order to attract new talent. Depressing. I had my first kid just months after FMLA passed or was implemented. It was new. I took 6 weeks off and to get paid, I had to use up all my vacation and personal time (some people don’t let you do that). The last two weeks were unpaid and I had to go back to work because I was the only one with a paycheck. Sigh. My second was only better because I was in grad school and it was summer. Abba, meatballs, Swedish bikini team = SWEDEN is AWESOME! I’m on paternity leave in Sweden, and it is all you would think and more. My wife and I spent the first year of my daughter’s life thrashing in the social quicksand of the New York City exurbs – invisible neighbors, abandoned playgrounds and evangelical Christian mothers’ groups for my wife, and little but work for me. 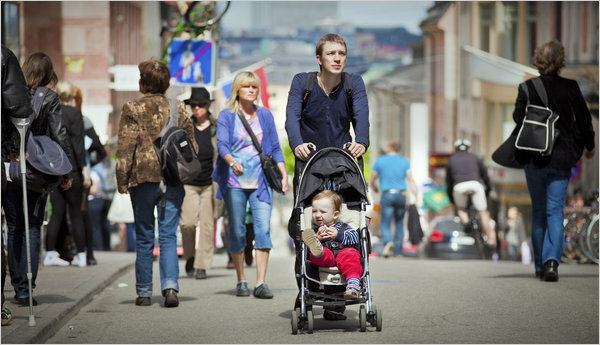 Then we moved to Sweden, and now I am on nine months of paid paternity leave. Each morning I dress and feed my two kids, get my daughter to preschool, and build sand castles with her little brother. I pretend I am a grumpy old troll, and I sing “I’ve Been Working On The Railroad.” By now – my second tour of what I call Daddyland – it feels unremarkable, the life of any stay-at-home dad. But that very normality is what makes it remarkable – the fact that I stay home, the subsidized daycare for my daughter, my monthly paycheck from the state, the “open” preschool where my son and I play, and the job held open for me without penalty. Plus, Sweden gets health care for their tax money, public preschool, higher education is free, etc.